This history recounts the formation of the Seventh Day Baptist congregation in Ephrata from the early Pietist movement in Germany to the founding of Ephrata and other communities in southeastern Pennsylvania in the 1730s. 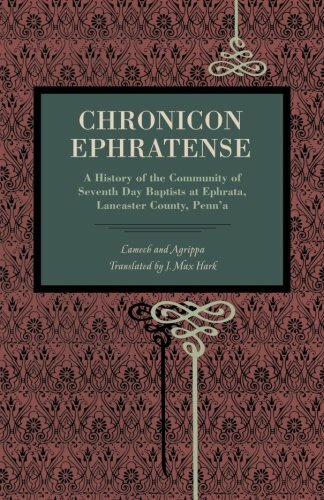 Focusing on the biography of the influential leader and superintendent Conrad Beissel (1690Ã¢ÂÂ1768), Chronicon Ephratense explores life in the Ephrata community through intimate portraits of its inhabitants. It contributes to and enriches our knowledge of the unique social and religious conditions among early settlers of central and southeastern Pennsylvania. This chronicle, originally published in dialectal German in 1786 under the names Ã¢ÂÂLamech and Agrippa,Ã¢ÂÂ was a specimen of early bookmaking in Pennsylvania and is rich in local idioms and ecclesiastical language. Agrippa, now known to be Peter Miller, compiled and edited the manuscript, written by Brother Lamech (now thought to be Jacob Gaas), a member of the community who had since passed away. This 1889 translation by J. Max Hark remains the only full English edition of the Chronicon Ephratense and has brought wider accessibility to this unique source for over a century.